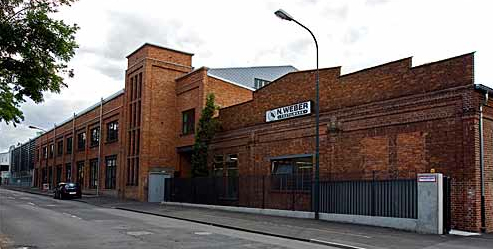 For over 125 years Nicolaus Weber has stood for excellence in textile manufacture. Our guiding principle is to think through customers’ individual requirements and create textiles that match them. Their high expectations are achieved using the most up-to-date equipment. Textiles from our highly specialised factory are destined for purposes as numerous as they are demanding: in the health sector, sterile cloth for operation instruments; in agriculture, conveyor belting; for the aero industry, kerosene filters. A huge variety of end-uses takes in environmental protection, food, furnishing, clothing, electronics, the automobile industry, safety at work, refineries, engineering, as well as sport and leisure. The list keeps on growing. The majority of our fabric is woven using polyester, polypropylene or high-tech PTFE and PES/inox-mixture yarns, as well as natural-fibre yarns like cotton and linen, which may then receive a special coating if required. One example would be flexible tubing or bellow-sleeves used on building sites. Most of our production is for customers in Germany, with the rest going to companies in neighbouring countries. Expertise, coupled with a capacity for breaking new ground explain why our customers include leading companies like BASF, Bayer, Dunlop and Mercedes Benz. The company is now into its fifth generation, which has been under the leadership of Claus-Michael Weber since the mid-1980s.